The Redneck Hippie: My First Sweater! I just finished my first sweater and I LOVE IT! I started it at the end of January and finished it just the other day. I'd been working on it in fits and spurts, having to rip things out, fix mistakes, stop 'til I could get into town to buy the right size needles, etc. Then one day last week I got sick. I knew what was coming, so stayed home from work that Monday, cleaned the house so I could be sick in peace, drank a lot of water, and took a lot of vitamin C in the hopes it wouldn't be too bad. It was actually quite nice the whole week, believe it or not. Yeah, there was the usual crappy feelings, aches and pains, sneezing and coughing. But it was actually quite peaceful, rainy all week, so I got to sit on the couch and knit the entire time and not feel guilty for not being outside doing something. I love it when it rains. Makes me feel all cozy being inside. I know all that peacefulness and lack of guilt made it easier for me to get well. And easier to finish the sweater! It's made of superwash wool, so it's machine washable. I do have to use the delicate cycle, but at least I don't have to do it by hand. I used DK weight yarn, so it was quick, but not bulky. And to break up the monotony of that expanse of boring, plain stockinette, I decided to dress it up with a cable detail of Xs and Os. It's my Hugs & Kisses Sweater. 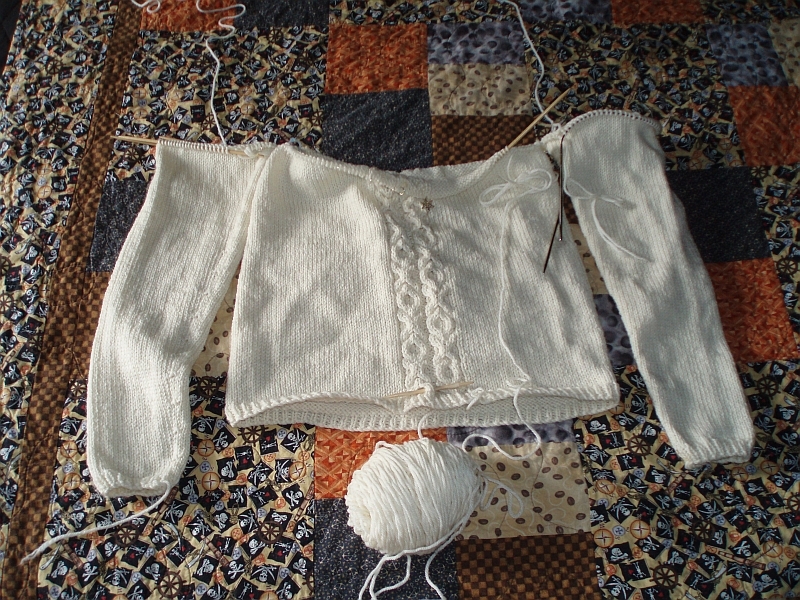 I learned how to do it from a book called The Sweater Workshop by Jacqueline Fee. It's a great book for learning how to design your own sweater using your own choice of yarn, needles and size. 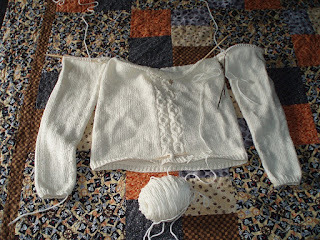 Most patterns give you a gauge (stitches per inch count) and supposedly, if you try out many needles and yarns until you knit the right number, the sweater will come out the right size once you knit the pattern according to the instructions. This is all fine and well in theory, but doesn't always work in practice. And, many times, even though the sweater looked great on the model in the pattern, it won't look good on you, only you can't try it on to see until you knit it. So you just have to step off that ledge and trust and hope that it will, knowing that it just might not, spending hours and hours of time making the thing, knitting up fifty bucks plus worth of yarn (and that's cheap yarn), only to finally find out that it looks awful on you. Doesn't make for very enjoyable knitting in my opinion. To avoid this, I wanted to learn to design my own sweaters, custom fit to me. I wanted to learn about yarn drape, how to make the sweater pull in at the right places, pooch out at others, and look good. This book was perfect for that. There's a short foreword/intro, then it jumps right in to instructions on how to knit a "sampler", a piece of knitting that is smaller and less daunting than an entire sweater, but that teaches you each skill needed in knitting sweaters ~ different ribbings, how to attach a new skein of yarn, how to widen certain stretches, how to decrease certain areas, how to change colors for stripes and such, and much more, even how to do buttonholes. 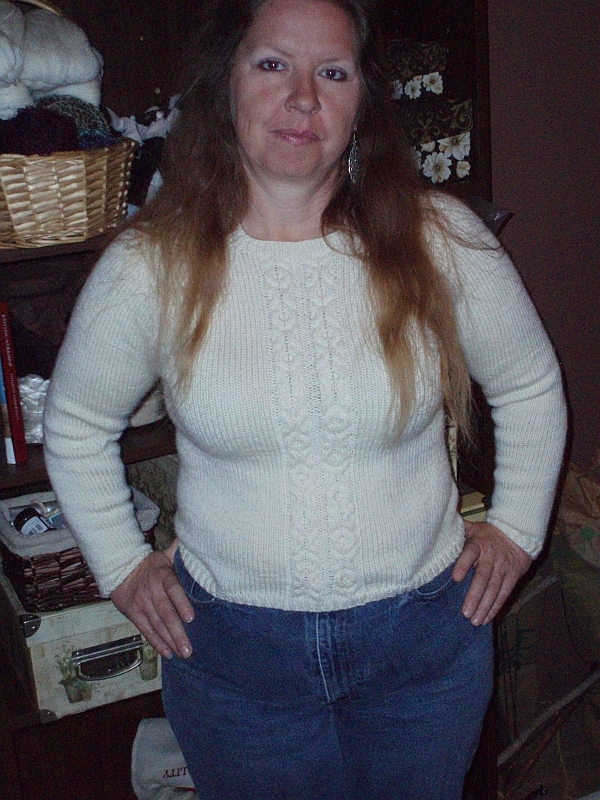 The sampler did something else for me ~ gave me the confidence to jump right in to making a sweater. I figured if I knit the sampler, I now possessed the knowledge to knit an entire sweater. So I joyfully and with no hesitation did just that. The book gives you a simple formula for calculating how to do that, laying it all out for you on the Gauge Page where you just fill in the blanks. You simply measure the chest of a favorite, well-fitting sweater you already own and use that to calculate percentages for every other part of the sweater you'll knit. And it comes out right! It's amazing. I did screw up a bit in not increasing the amount of stitches after knitting the original ribbing. When I realized that, I was about 3/4 of the way through ~ too far to rip it back and redo it, but not far enough that I would quickly get to the end to find out if it was okay. But all was well ~ since it's knitted from the bottom up, I was able to try it on and found out though a bit snug, it fit. I had to do some fancy calculating and adjusting to get it to decrease correctly up to the neck. Since the book was giving directions on the number of stitches I should have had, and I had less than that, it took a while to figure it out. But I did it! And it wasn't that hard, thanks to the skills I'd learned in the sampler. 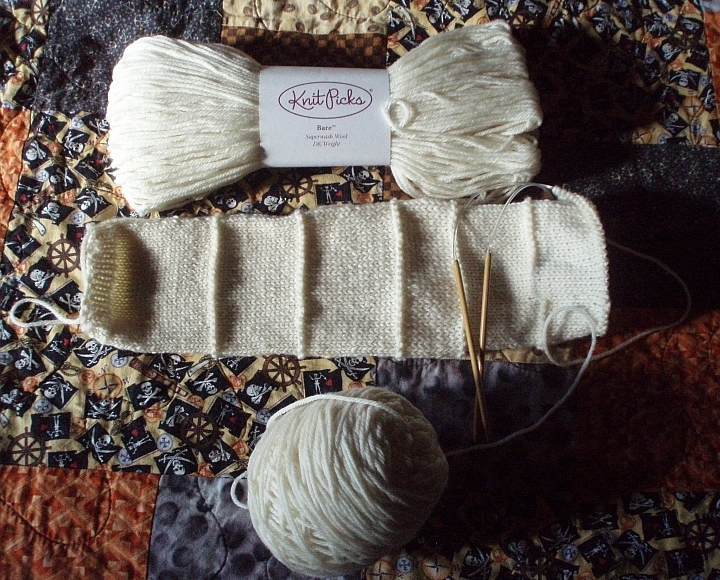 That's what doing the sampler did ~ taught me to knit fearlessly. Yes, there was some cussing involved when I found out about my screwup (okay, there was a LOT of cussing involved...). But I wasn't really afraid. I knew I could do it. And I did. And now I have a rather boobalicious sweater to show for it.